The Hilton Mission Valley Hotel was constructed in the early 1980’s as a vacation style hotel with 349 rooms. The hotel property includes a significant native hillside, protected habitat areas and existing specimen trees. The project is a remodel whose goal is to upgrade the hotel property, incorporate modern hotel amenities that will enhance the visitor experience and create new venues for meetings, weddings and social functions. The primary new site amenity is an outdoor function area nestled into the hillside. The function area will be comprised of a large elevated wooden deck, pavilion and terrace poised for wedding and social celebrations and an adjoining swimming pool & Jacuzzi area that incorporates a fire feature, sunning areas and a picturesque lounging deck. Both the wood deck and pool area are connected with grand staircases and a lift and are ADA compliant. Other site improvements include a new up-graded guest entry and drop-off area with enhanced paving, planting, site furnishings and water feature. 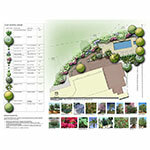 A new contemporary themed, water conserving planting design was also created for the project. The project design was executed in compliance with the Hilton Hotel branding standards.